Our vision is to live in a world that embraces all ability. Imagine working side by side with a truly inclusive workforce, where all employees are appreciated for the value they add, where there are no labels, only peers who make their place of employment a success. Valuing our uniqueness and making space for people with autism builds a better world for us all. Sadly, we are not living in that world today. 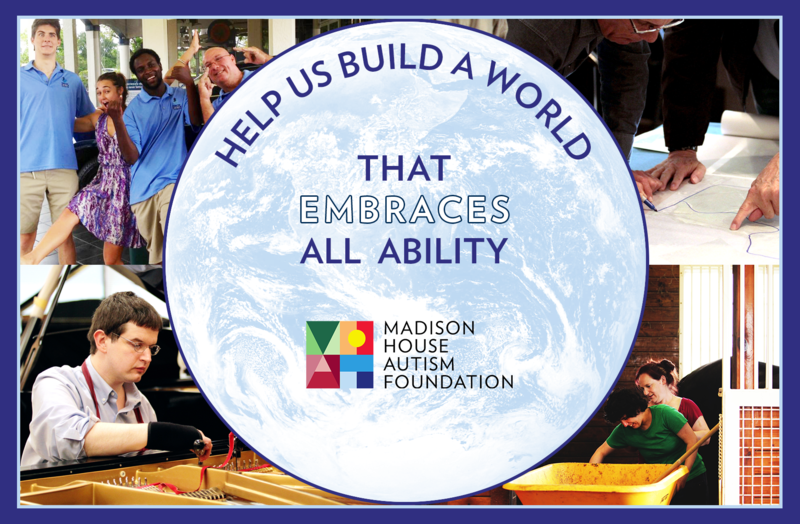 HELP US BUILD this climate of integration by donating to Madison House Autism Foundation (MHAF) today. Together we can expand opportunities for adults with autism, and people with intellectual and developmental disabilities to live and work with our community at large. Your gift helps strengthen our communities with innovation, creativity, and dedication. Your generosity will help support, train, mentor and elevate models for businesses that can be replicated across the country. We are working to expand our Autism Housing Network to include employment and follow the same pathway to educate, inform, advise and connect those looking for employment support, both for employer and future employee. Your support creates the village we all need. BE the difference, BE the change and BE empowered to build a better world. TEXT the words MADISONHOUSE to the number 44321 where you can text your donation for your convenience.